Hearthstone decks come and go, but certain strategies are so prevalent that they never really disappear. Minion-heavy “Zoo Warlock” decks have always been around in some way or another, but throughout the game’s current Boomsday Project expansion, it’s been one of the strongest decks in the game. Just as “aggro” decks aim to kill the opponent as quickly as possible and “control” decks survive until their powerful late games, “zoo” decks stack the board with cheap minions in the early game, then use other minions to snowball them into a victory. By playing mostly creatures, Zoo Warlock ensures that it’s always putting something on the board, which helps the archetype take control of the game. 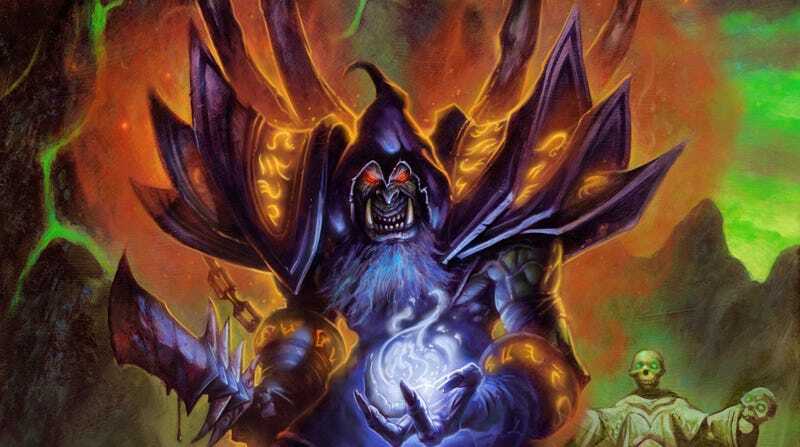 Warlock is one of the only classes in the game that can effectively run a zoo archetype because of its hero power, which lets the Warlock draw a card and keeps it from running out of fuel. Zoo Warlock has always been one of my favorite Hearthstone decks. Since the deck’s objective is all about stacking the board with minions, you can usually brute force your way to victory by simply dumping your hand. This makes the deck very easy to pick up and play, while the nuances of aggression and control add layers of complexity that help teach beginners the deeper ideas of what it takes to win in Hearthstone. Do you hit the enemy’s health points, or take out your enemy’s minions? Do you add more minions to the board, or wait for your opponent to use their board-clearing spells so that you have more to play in later turns? Do you play a sub-optimal minion to keep stuff on the board, or do you use your hero power to draw a card and hope you can make a better play next turn? Adding to the deck’s accessibility is the fact that it’s one of the cheapest in the game to build. Since most of the minions in Zoo Warlock come at a low cost and have relatively simple effects to buff each other, most versions only run one or two Legendary cards. If you’re missing a card or two from a deck list you’re seeing online somewhere, you can always switch it out with a minion that does something similar. This modularity helps beginners learn the basics of deck building: as long as you know your strategy for winning, you can use multiple cards to get there in a Zoo Warlock deck. More than that, though, I love Zoo Warlock because of how well it introduces newbies to the feeling of a good deck. Using a Zoolock for the first time is like getting behind the wheel of a 5-series BMW after bumping around in a ‘97 Jetta. Your turns flow into one another. You grab early leads and squeeze out wins fast. You always have something to play. Your decisions feel like they matter. Every good Hearthstone deck has this optimized feeling, but Zoo Warlock offers it in a beginner-accessible package that’s proven itself to stay relevant over the long-term. So next time you get steamrolled by a Zoo deck that has five powerful minions on the board by turn two, try not to get bitter. If anything, Hearthstone needs even more decks that feel good to play, aren’t crazy expensive, and can actually win.